In this season of gratitude, quality child care is near the top of the list for the young families fortunate enough to have found it. 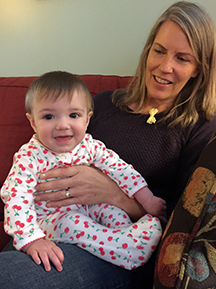 This fall, one NMC alumna took a step toward filling that crucial community need by doubling her home child care capacity, including more desperately-needed infant care. 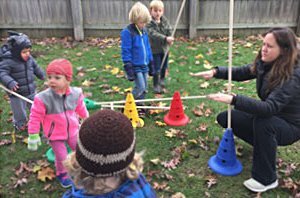 Alison Burns’ Healthy Start Child Care in Traverse City also now employs two NMC child development students, (including Emily Spica, above) providing them valuable work experience. A licensed provider in Michigan since 1996, Burns (right) originally chose child care as a way to stay home with her own three children. Until this year, her license limited her to six children in care simultaneously, only two of whom could be under a year old. However, Burns self-limited infant enrollment to one. She frequently had a waiting list, and felt badly for the families she had to turn away. “There’s such a demand for infant care,” she said. Then this fall, timing and preparation coincided, allowing Burns to help meet that demand. Back in 2011, inspired to learn more about children with special needs after one came into her care, Burns enrolled in an Exceptional Child psychology class at NMC. Child development program coordinator and instructor Cheryl Bloomquist then persuaded her to complete the entire Child Development certificate course sequence — 32 credit hours. Even after practicing child care for 15 years, Burns found herself invigorated in the classroom. “It reinforced what I already knew, (and) I learned so much,” she said. An Infant and Toddler Development class was especially beneficial, she said, bolstering her knowledge of best practices for that age group and confidence working with them. She completed her certificate in 2013 and returned to running her six-child daycare home. She also made time to serve on Bloomquist’s Early Childhood Advisory Committee. “Her input is so valuable, because I don’t always have a family home provider there,” Bloomquist said. Fast-forward to this fall, when Burns’ youngest daughter left for college, creating more physical space for child care in their home. Simultaneously Burns was up for relicensing, and the lack of child care regionally had become an acknowledged obstacle to continued economic growth. Burns decided to expand her license to allow her to care for 12 children, up to four of whom can be younger than 18 months. All those slots are filled, and in fact she cares for 19 different children over the course of a week, since some attend part-time. She also turned to NMC to find staff. Both Kalee Lown, lead infant and toddler teacher, and Spica, lead preschool teacher, are NMC students. On a recent brisk morning, Spica played with preschoolers in Burns’ backyard while Lown and Burns each held an infant, and another napped. Burns empowers them to use their education on the job. “These teachers are teachers. They’re not just waiting for me to tell them what to do,” she said. For information on Healthy Start Child Care, call (231) 933-7002.